Visit ITforU.org, your portal for IT and CS education resources. You and your students can browse listings for all CS programs offered at public, higher-ed institutions across MA, and find internships, financial aid info, and a collection of inspiring profiles and information. November 29, 2017 ---- The Commonwealth Alliance for Information Technology Education (CAITE), part of the University of Massachusetts Amherst's College of Information and Computer Sciences, and the MassTLC Education Foundation have once again partnered up for Computer Science Education Week (CSEdWeek) Dec. 4-10, an annual program dedicated to inspiring K-12 students to take interest in computer science. 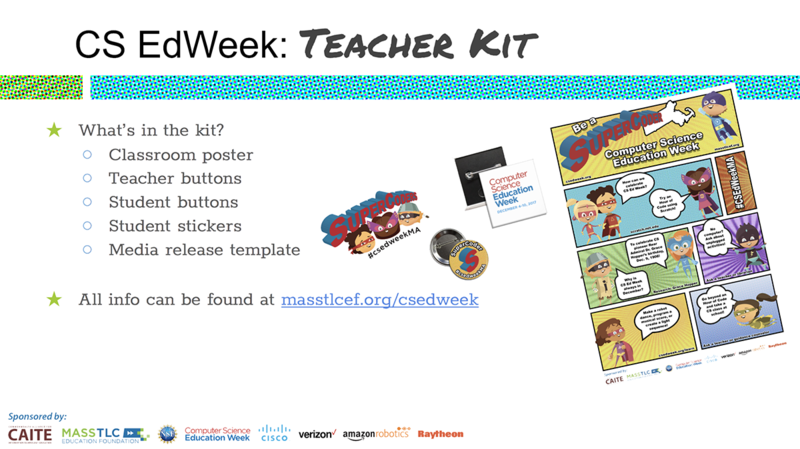 Through the combined effort of CAITE and MassTLC, more than 250 #CSEdWeekMA teacher kits were distributed to Massachusetts schools and organizations to help them prepare for, and promote, CSEdWeek. Those who registered online were sent buttons, stickers, posters and other communication tools. Two webinars were also offered to engage educators wishing to learn more about how to engage girls and underrepresented minority students in CS and host successful CSEdWeek events. Events include everything from participating in the national effort, Hour of Code, to designing a webpage, “teaching” a computer to sing, and programming a robot to dance. There are also “unplugged” activities available that don’t require a computer. Some schools devote class time, incorporating computer science activities into the curriculum, and some offer after school programs. Another path of CSEdWeek involvement is through volunteerism. In the past, CAITE has helped to coordinate volunteers to interact with students in the classroom – as speakers or to do hands-on activities. CAITE also assists teachers in professional development, such as Scratch Ed, offering additional teacher resources that directly benefit students during CSEdWeek. CAITE has been promoting and supporting CSEdWeek since it began in 2010. Over the years, Massachusetts has been among the states with highest participation in CSEdWeek. According to the CSEdWeek website, there are currently 621 Hour of Code events scheduled in Massachusetts. CSEdWeek is endorsed by Congress to commemorate the birthday of Grace Hopper (Dec. 9, 1906 – Jan. 1, 1992), a United States Navy Rear Admiral and 1944 graduate of the Naval Reserve Midshipmen’s School at Smith College in Northampton, Mass. Hopper was a computer science pioneer and invented the first compiler for a computer programming language, leading to the development of COBOL. She also was an advocate of training young people in computer science. CSEdWeek is a call to action to share information and offer activities that engage all students in hands-on computing. This year, hundreds of thousands of students, teachers, parents, and members of industry will take part in more than 100,000 CSEdWeek events globally. To stay up-to-date with #CSEdWeekMA news and events, follow @CAITE6 on Facebook and Twitter. To learn more and get involved with #CSEdWeekMA, visit www.masstlcef.org/csedweek.